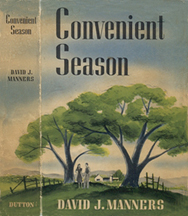 Convenient Season, published by Dutton in 1941. Under Running Laughter, published by Dutton in 1943. The Wonder Within You, a collection of David Manners' meditations, is edited with a biographical introduction by David Morgan Jones. The world knew David Manners for his roles in Dracula, The Mummy, Bill of Divorcement, and over 30 other films from 1930 to 1936. But David was much more than flickering images on the silver screen. He walked away from the fame and riches of Hollywood to find his understanding of the nature of God and the universe. In the Mojave Desert, at Yucca Loma ranch, he found peace from Hollywood. He wrote novels and studied religious and metaphysical writings. Leaving behind his upbringing in the Anglican and Episcopal Churches, he combined elements of New Thought (Unity, Religious Science, and Christian Science) with Zen, Taoism, and Buddhism. 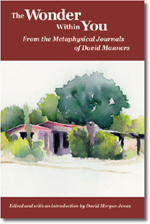 From 1978 to 1993, David kept journals of his daily meditations about God and living in joy ­ as life is meant to be. The Wonder Within You presents excerpts from these journals and his newsletters. Order The Wonder Within You from Amazon.com.